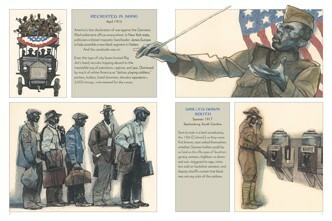 Just released from Creative Editions, this picture book tells the story of African American soldiers who fought in an all-black regiment in World War I, and which included among their ranks Henry Johnson, whom Theodore Roosevelt called "one of the five bravest soldiers" in the war. The Harlem Hellfighters also included Jim Europe, a jazz band leader, and his band members, who played for the weary troops overseas. The book includes the history of the unit during and after the war, as well as giving details about some of the things going on back in the United States, such as the shameful lynchings of black men in the South, which went ignored by President Wilson for far too long. A mix of free verse and prose poems is paired with illustrations reminiscent of a graphic novel style, evocative as much as descriptive, as in the case of the two spreads on pages 12 and 13, which I photographed to share with you below. 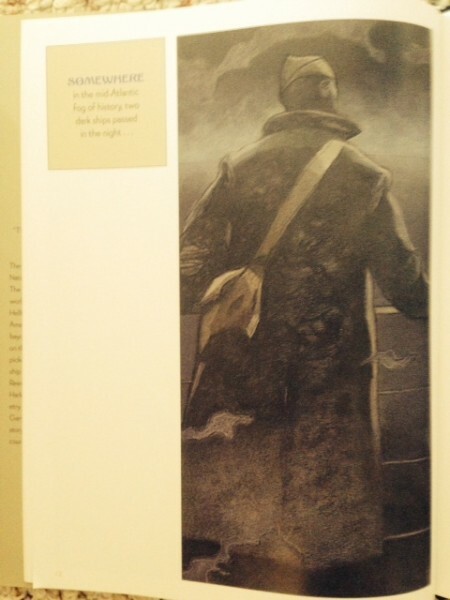 The text reads, "SOMEWHERE/in the mid-Atlantic/fog of history, two/dark ships passed/in the night . 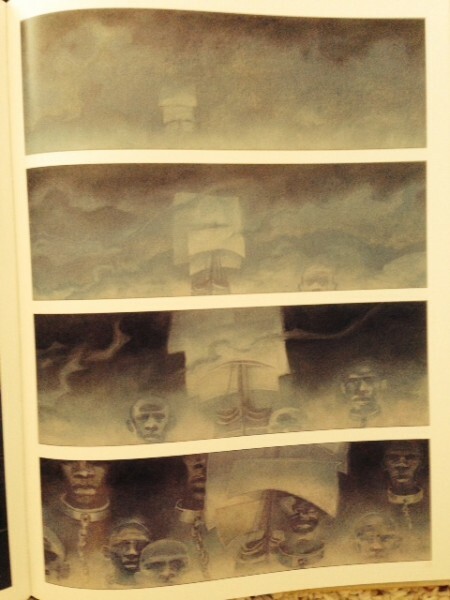 . ." The illustrations juxtapose the serviceman on the left, sailing toward France to defend his country, with a ghostly slave ship coming west, and it's one of the most haunting series of images in the book, which is saying something. The back matter in the book includes an eight-book bibliography, as well as five different artist's notes, in which the artist credits other artists from whom he borrowed an image or idea. The book covers a lot of ground in only 32 pages, and does it in a thoughtful, informative way. A real must for libraries everywhere, people interested in World War I history and/or African American history, and folks who love great poetry and great art. My thanks to Creative Editions for the review copy. The graphic novel is also amazing! I need to check out this pic bk. I need to check out the graphic novel, apparently!